Our Statesman calendar clock and photoframe with logo is an excellent desk top gift. This solid metal item will carry your details with style. 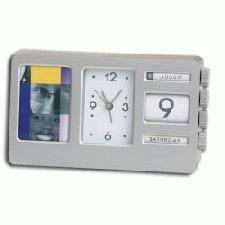 So why not advertise your details upon a Statesman calendar clock and photoframe with logo today! It would suit someone elses desk, safe in the knowledge that your logo will stand strong. Other promotional and personalised items besides our Statesman calendar clock and photoframe with logo click here. To find out more about our Statesman calendar clock and photoframe with logo click here and fill in the contact form and we'll get straight back to you.